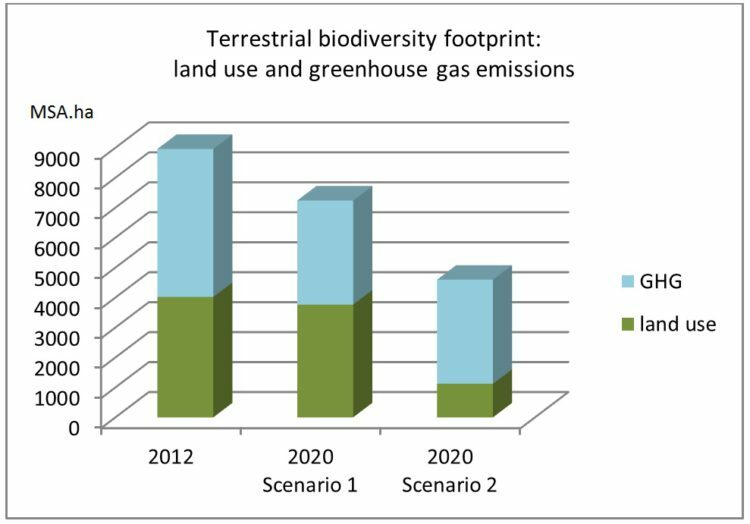 This page provides a short technical description of the biodiversity footprint method. Information on its goals, characteristics and implemented case studies is provided on the Biodiversity Footprint page under the Expertise menu. That page includes links to the full reports that contain a more detailed description of the method and its calculations. 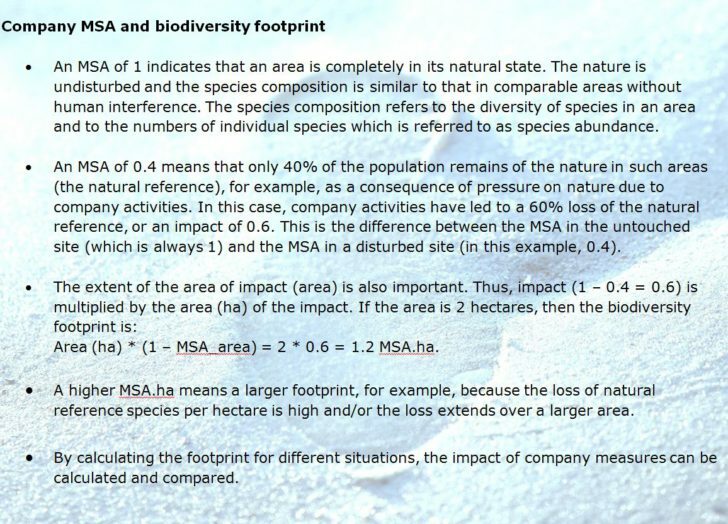 This equation is used to calculate a biodiversity footprint MSA.ha for a baseline and for different scenarios, enabling comparisons to be made. The footprint method includes the impact of the following pressure types: land use, climate change, water extraction, and of nitrogen and phosphorus emissions in water. The biodiversity impact of these pressure factors is described briefly in the textbox below. Because of the direct relationship between land use and biodiversity, this pressure factor plays a key role in determining a company’s or a product’s impact on biodiversity. Land use can play a role in various parts of the production chain. This concerns, for example, land use for production of raw materials by suppliers and by the company itself, and also land use directly related to the company’s own production processes (for example, plant site, storage facilities), and possibly land use associated with waste processing. Because the impact varies per land use type, each land use type is determined separately. Thus, the area and type of land use management in each part of the production chain has to be determined. For a number of land use types, the GLOBIO3 framework MSA values are based on a dose-response relationship between land use type and biodiversity. For company site locations, the MSA land use value is set at 0.05. This value means that for this type of land use only 5% of the original biodiversity remains and thus 95% has disappeared. The MSA values of the generic GLOBIO3 land use classes are averaged. In reality, MSA values vary depending on land use intensity (Alkemade et al. 2009). There may be large variations particularly for secondary forest and plantations, for instance because of differences in management, such as clear felling versus selective felling, rotation length, and species composition. MSA values can be determined or adjusted to differences in local conditions by using local expertise on the natural state of a land use type in a specific region. In determining the land use area, it is important to consider whether the company is responsible for the total land use or whether the land has multiple uses. In the latter case, an economic allocation of the use should be applied in which a company is allocated only that part for which it is responsible. Greenhouse gas emissions contribute to climate change, which in turn has an impact on biodiversity. The climate-related dose response relationship used in GLOBIO3 shows the decrease in biodiversity (MSA) versus the increase in mean global temperature (see Arets et al., 2014). Thus, the contribution of greenhouse gas emissions to the mean global temperature has first to be determined. This requires insight into the greenhouse gas emissions of the company and its products for which the biodiversity footprint is to be determined. It concerns, for example, emissions from transport, energy and heating, and process emissions as well as emissions from agriculture and land use. Because climate change has not only a local but also worldwide impact on biodiversity, the climate impact on MSA occurs worldwide in natural and semi-natural ecosystems. Thus, the MSA impact per ha is multiplied by the total global land area for ecosystems in natural and semi-natural state. This delivers emissions per kg in CO2 equivalent, an MSA impact of 3.29 ·10-5 MSA.ha (see also, van Rooij et al., 2016). In addition to the immediate impact on a location that is already discounted in the MSA impact for land use, water abstraction has an impact on nearby nature areas. The impact is largely local and depends on site conditions, such as groundwater table, soil types and vegetation response to potential changes in water availability. The effect of water extraction on water availability also depends on the depth, length of period, and location of the water extraction in relation to vulnerable nature areas. The impact is determined from the reduction in the Mean Spring Groundwater Table (GVG), which is a good measure of drought effects. The first step in calculating the MSA for water extraction is to determine the potential GVG without additional water extraction and for the present situation with water extraction by the company. In determining the potential GVG without water abstraction, use is made of soil maps, hydrological models and information from monitoring wells and relief maps. In addition to land use, greenhouse gas emissions and water abstraction, nitrogen and phosphorus emission to water is a key pressure factor on biodiversity that can be exerted by companies. 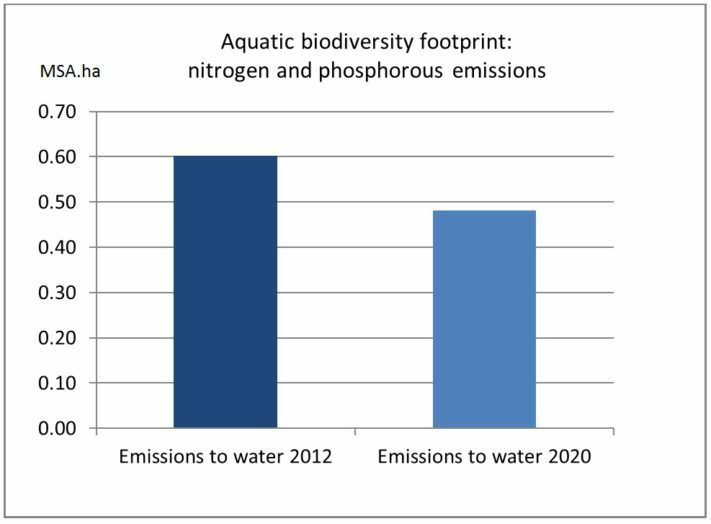 For canals, rivers and lakes, the dose-response relationship between nitrogen or phosphorus concentration, and biodiversity is available from the GLOBIO aquatic methodology. This relationship is used to calculate the impact on aquatic biodiversity. The aquatic pressure factor is calculated separately and not added to other terrestrial pressure factors because of its deviating characteristic, for instance, variation in flow and depth. The method is described in this report but was not assessed in the current cases because the pressure factor was either not relevant or data were insufficient to calculate the impact. However, the impact of these emissions was applied in the three cases in the earlier Plansup study (see van Rooij et al., 2016). Using these methods, the biodiversity footprint of various situations can be compared for the same functional unit, for example, for a certain quantity of semi-finished product or end product. 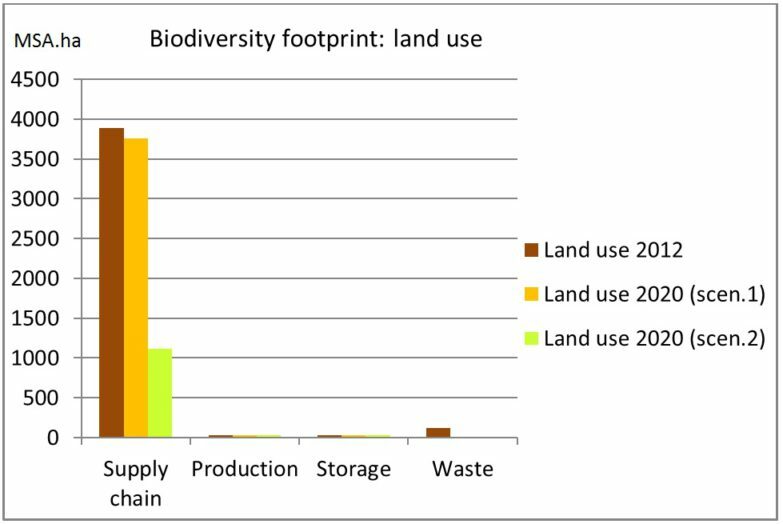 The biodiversity footprint of the current situation without measures, referred to as the baseline, can be compared with the footprint of an alternative or future situation in which biodiversity friendly measures are implemented. Alternative production methods or the use of different raw materials can also be compared. 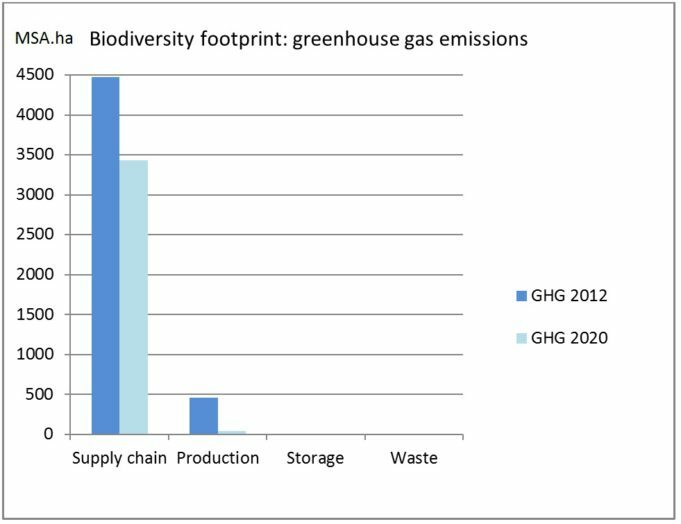 See for an example of company scenarios the biodiversity footprint reports. Links to these reports, factsheets and summaries are provided on this page. A web tool has been made for a limited version of the methodology. See for more information the webpage of the Biodiversity Footprint Calculator.